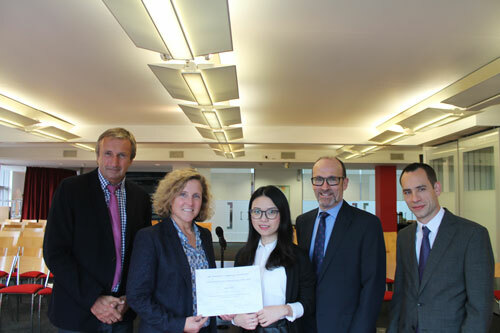 Anran Chen, a third year PhD actuarial science student at Cass, has been awarded the 2017 Dimitris N. Chorafas Foundation Award for her thesisThe Impact of Behavioural Factors in Annuitisation Decisions and Decumulation Strategies. The prestigious award offers a prize of $5,000 that rewards scientific contributions made independently by junior scientists in their last year of PhD thesis preparation. Prizes are awarded annually by the Swiss-based Chorafas Foundation with the goal of stimulating promising young researchers. Anran has completed her PhD in the year 2017. Her thesis investigates the annuity product design in the UK and other countries, and proposes the use of deferred annuity products to optimise the consumption in the post-retirement period. Professor Marianne Lewis, Dean, Cass Business School, said: "We warmly congratulate Anran on this significant achievement which will further launch her research career. Our Faculty of Actuarial Science and Insurance is one of the leading actuarial departments in the world, providing thought leadership that shapes policy and regulation. Anran's research is an excellent example of this."